Choose a figure from the pull-down menu or make one yourself by clicking on the cells with a mouse. 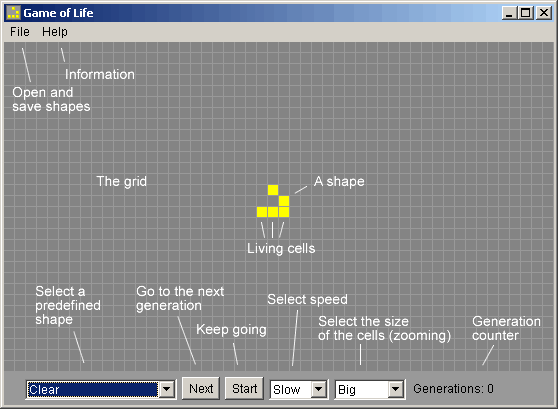 A new generation of cells (corresponding to one iteration of the rules) is initiated by the 'Next' button. The 'Start' button advances the game by several generations. Game speed is regulated by the Slow-Fast-Hyper pull-down menu. With the Big-Medium-Small pull-down menu you can change the size of the cells, like you are zooming in or out of the grid. You can open or save shapes from the File menu. You can also drag shape files from your harddisk or from a web page to the program. On Windows you can open a shape file (with the .cells file extension) by double clicking it. The latest version, the Life Lexicon and other information can be found online. The first version was a simple Java applet written in Java 1.0 and put online on July 3, 1996. The Game of Life is invented by John Conway. This license is about this software (the program, documentation and graphics). You are free to use this software. You are free to distribute the software in unmodified form.